The structure of the planet is fairly simple to understand. Just as the atmosphere has layers, the upper layers of the Earth have layers. If you look at the outside of the planet, you can see that about 65% of the planet is covered by oceans of water. The rest of the 35% of the surface is made up of the continents. Let's look at the ocean zone first. Scientists break the floor of the ocean into three basic levels. The abyssal plain is the deep ocean floor. The mid-oceanic ridge is the middle layer. The final division is the ocean trench. The trench is the deepest part of the surface of the planet. Maybe you have already heard that the distance from the floor of the ocean to the top of a volcano in Hawaii is higher than any mountain above the surface. If you hadn't heard, now you have. Cool! On the edges of the oceans are the continental slopes. They are the fringes of the continental plates. Chances are, you're on land right now. Scientists would say you are living on the sial. The sial is the part of the crust that is above water. It's a continental plate floating over the globe. Right underneath the sial is the sima. The sima is the layer of the Earth's crust that covers the entire planet. The sial is different in that it can begin and end where the plates do. You can think of the sima as the ocean floors. Under the sima is the mantle. When you consider the mantle is when you really start talking about the inner workings of the planet. When you learn the layers of the Earth there really isn't a lot to explain. It's one of those memorization things. You might be wondering how all the layers came to be. When the Earth was forming billions of years ago, the matter came together. 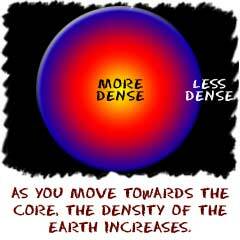 The densest matter moved to the center of the planet. The lighter rocks remained on the surface. When everything was done, the mantle wound up being about 2/3 the mass of the planet.